Abortions Illegal After Heartbeat Detection. I would support this but it is stupid. It basically makes abortion illegal. Heartbeat happens around week 6 and some don't even know they are preggers at that point. Yup, heartbeat happens quite early, some women may not know they are pregnant. I think 14 weeks is a good place to stop, if they must be done. After that brain function has been present, they can hear, feel... they feel pain. Any limit to sensitivity of the instrument used to detect a heart beat and differentiate it from the mother? Any proof required to ensure the health care person isn't making up the presence of that heart beat in order to justify not moving forward with the abortion? Any solid science present that the presence of a heart beat is only after a functioning brain capable of sentient thought has developed (if no brain though a beating organ is meaningless). I bet the answer is no and a no on purpose. The purpose being to make it damn near impossible for any woman to get an abortion even though the highest court has ruled it is unconstitutional to prevent a woman from having one. There are enough stupid people in this world, the human species is not going to go extinct if every capable child bearing woman does not give birth. I see no logical reason a man should ever force a woman that does not want to give birth to have to endure labor. Now if a woman president, a full woman supreme court, a full woman congress wanted to make abortion illegal after the majority of the women (men not included) voted to do so.... them maybe I would have not opinion on the subject, but that isn't going to happen anytime soon. These kind of laws are circumventing the supreme court ruling that abortion is legal. Whats the point of having a high court if you ignore there rulings and make laws that prevent a woman from being able to get an abortion. If your opposed to an abortion its easy, just don't get one, problem solved. I see no logical reason a man should ever force a woman that does not want to give birth to have to endure labor. In a society where 100% of reproductive choice is mase by the woman it should be unethical to hold men accountable. Heck the courts are forcing men who aren't the biological fathers to pay child support! This issue isn't one there can be comprise on. One side believes it murder, the other will settle for nothing less than complete autonomy for woman, to the point of trying to legalize actual infanticide. Personally I think first trimester abortions with allowance for actual medical emergencies is adequate. Women have a dozen forms of birth control, two morning after pills, three monthsto have an abortion, adoption, and abandonment at 'safe drop' centers all without any repercussions (and all can happen without consent or notification of the father). 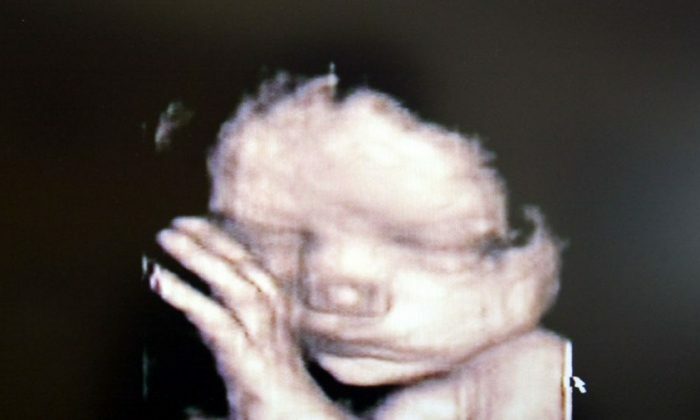 While the killing of any human at any stage of development is to be encouraged, it is interesting to note that confused and mincing humanity alternately whines or gloats that the killing of a fetus with a vacuum cleaner is murder and that the killing an enemy fetus with a bomb is patriotism. Such a law would never stand up to a constitutional challenge. Such a law wouldn't even likely pass in the state. It is just a pubicity stunt.